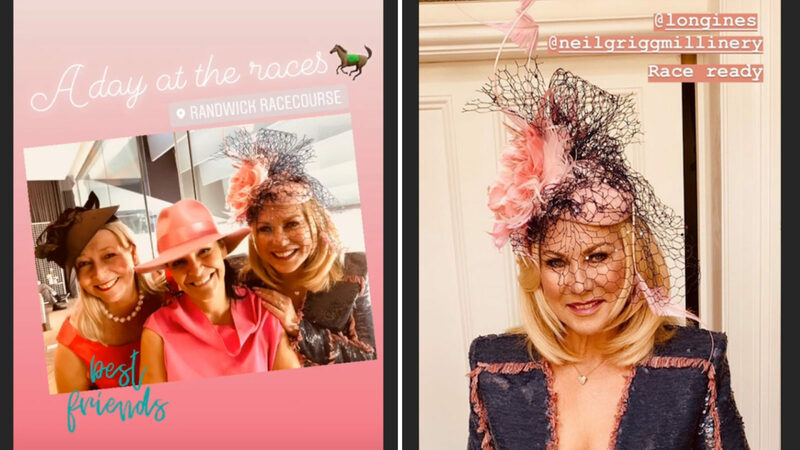 It wouldn’t be a day at the races without the glitz and the glamour and that’s exactly what Studio 10 star Kerri-Anne Kennerley opted for when she attended day two of The Championships at Royal Randwick Racecourse in Sydney. The 65-year-old presenter is no stranger to fashion and turned heads in another trendy outfit on Saturday. Kerri-Anne dressed to impress with a variety of vibrant colours in her latest fashion ensemble. The former Dancing with The Stars contestant matched a pink top with a blue and pink jacket and powder blue skirt that showed off her legs. Adding some sparkle to the outfit, the Logie winner wore a metallic pair of heels to the event. Perhaps the highlight of Kerri-Anne’s outfit was the sophisticated fascinator the star wore over her luscious blonde locks. Before the event, KAK took to her Instagram Stories to share her excitement with fans. “Race ready,” she wrote, alongside a photograph of her outfit. In another shot, the star beamed with delight with some of her friends. It’s not the first time Kerri-Anne has been spotted at star-studded events in glamorous outfits. Earlier this week she was a special guest at The Real Housewives of Beverly Hills party, held at Sydney’s iconic Ivy Penthouse. For that outing, the former Good Morning Australia host stood out from the crowd in a knee-length dress, matched perfectly with a pair of bright orange ankle boots and some chunky jewellery. The TV personality chose to keep her hair down and straight for that event and completed the look with a bright pink lip and a touch of blush. Earlier in April, Kerri-Anne made her first public appearance following the death of her husband John in April. Despite dealing with immense grief since John’s death, Kerri-Anne picked herself up and fronted cameras at the opening night of Saturday Night Fever in Sydney. The former Midday star looked gorgeous in a 1970s inspired outfit for the event at Lyric Theatre and was photographed in a bright orange and sequinned long-sleeved top and black flared pants. Fitting with the theme of the night, Kerri-Anne made a bold statement with a pair of dangly gold earrings and a chunky gold necklace and accessorised with a black sequinned handbag by her side. It was the perfect fit for the launch of the musical which is based on the 1977 movie of the same name, which stars John Travolta. Just like the film, the production is filled with disco classics including the Bee Gee’s hits ‘Stayin’ Alive’, ‘How Deep is Your Love’, ‘Night Fever’, ‘Tragedy’ and ‘More than a Woman’. What do you think of Kerri-Anne’s latest outfit? What would you wear for a day at the races?